Many of you reading this became a Christian when you were just a kid. You figured out that Jesus – the Son of God – died on the cross for your sins and then rose from the dead. A parent or a Sunday School teacher told you the gospel, the good news that if you would ask Jesus to come into your life you could go heaven and not to hell when you died. You believed in the Word of God with the simple faith of a kid and that was that. We’re going to spend this next week figuring out what “that was that” means. What exactly happened between you and God in the moment that you trusted in Jesus for your salvation? What comes with belonging to him? Two huge things for starters: You were justified from all sin as if you had lived the sinless life of Jesus yourself. Because of that, you have peace with God. Did you notice that last sentence is in the present tense? You have peace with God now and forever. Even when you don’t feel peaceful, even when you have sinned again and feel guilty, you still have peace with God because you have been justified by trusting in Jesus. Think: Some people spend their whole lives hoping to find out they have peace with God when they die. How confident are you that you have peace with God right now? What do you base that confidence on? Pray: Thank God that through faith in Christ, you are justified from your sin and you have peace with God forever. Do: Start a list for this week of all of the benefits listed in Romans 5:1-11 that come with trusting in Jesus for our salvation. Put these first two items on the list: 1) justified and 2) peace with God. Did you start your list yesterday? We’re counting up everything that happened between us and God at the moment of our salvation. That is, we’re counting up everything he did for us. So far we have 1) We were justified from our sin, and 2) We have peace with God forever. More: We have God’s grace right now. We’ve all heard the word grace talked about. We know it’s a big deal, but we don’t get it. We don’t have the capacity to understand a) how deep our sinfulness goes or b) how completely free God’s forgiveness was. I think if we could glimpse either of those for even just a moment, we’d be knocked over backwards by humility and gratitude. Backwards! More still: We get to go to heaven! “We rejoice in the hope of the glory of God.” We will be with him forever, which is what we often really mean when we say heaven, that we will share in his glory in person, face to face, always. This is the one we probably really cared about when we “got saved,” and it’s only number 4 on the list. Pray: Thank God for His grace to you through your faith in Jesus. And ask him to help you to know better how to rejoice in the hope of the glory of God. Do: Keep your list going: 3) We stand in grace. And 4) We’re going to heaven! We’re continuing to work our way through Romans 5 to find all of the things God did for us at the moment of our salvation. Check out the last two devos to catch up with the list so far. Do you ever suffer? Of course you do. We all do. We might not say, “I’m really suffering” when we get sick or hurt or lose something that matters to us, but suffering can include emotional as well as physical pain. Suffering is part of life for everyone. But for those of us in Christ, Paul says, suffering has a point. In fact, suffering is worth celebrating because it gives us another chance to exercise our faith in God. And that exercise builds our Christlike character. And as our character grows, we learn to hope in God with greater and greater confidence. Think: Have you ever actually rejoiced about your suffering? Can you see how suffering for believers can be a good thing if it makes us more like Jesus and makes us more convinced of God’s goodness? Pray: Ask God to help you to be grateful even for your suffering, and thank him that you don’t ever need to suffer pointlessly. Do: Add the next benefit of salvation to your list: 5) Our suffering helps us grow. Still building your list of all the earth-shaking things that God does in and for us at the moment we trust in Jesus for our salvation? Any of the things Paul has already described would easily draw us into a lifetime of grateful service to the King. But the list isn’t finished. Today we learn not only that God loves us – he must love based on everything he’s done for us, right? – but also that he’s installed his love in our hearts, inside of us. It’s not just an external “I love you,” it’s an internal “my love lives in you.” I don’t get it, fully, but it suggests that he is closer to us than we can imagine. How? For one thing, he himself is with us, personally, right now, in the form of his Spirit. It’s the Comforter Jesus promised to his lonely disciples. It’s the ultra-high self-powered broadband connection to the God of the universe which empowers us both to understand his Word and obey it. And it – he! – is the guarantee that one day this spiritual connection will become the face-to-face, wiping-our-tears, sharing-our-space relationship we were always built for. Think: Do you tend to under-estimate the difference having God’s Spirit with you makes in your life right now, today? What could you do to be more intentional about walking in the Spirit’s power? Pray: Thank God for his love, installed in your heart, and for his Spirit with you every moment of every day since the moment you trusted in Jesus for your salvation. Do: Add the next two items to the list you started at the beginning of the week: 6) God’s love in our hearts, and 7) God’s Spirit with us. If you’re just joining us this week, we’ve been building a list. We’ve been itemizing all the huge things Paul describes in Romans 5 that God has done for us in relation to our salvation. It’s a list that always makes me feel more humble and more deeply loved by God. He owed me zilch, and he gave me – and everyone in Christ – all of this. Of course, he did it because I was such a good person, right? He could see into my heart and knew that something special was beating inside of me, that I would one day earn the sacrifice of his only and deeply loved Son Jesus. Right? Wrong. The only good in me was the good left over from his original design. Everything I’d done with it was bad, sinful, wrong, and weak. So why did he do it? The answer doesn’t satisfy me, because it doesn’t give me anything to take credit for and I don’t really understand it. But I’m so grateful that it’s true. Think: Think about the human being who loves you most in the world. Can you see yourself maybe dying for that person? Now think about the person who likes you least, maybe even despises you? (Think of his or her face.) Would you ever want to die for him or her? Can you imagine asking that person who loves you most to die for the one who can’t stand you? Pray: Thank God for demonstrating his baffling love for you by sending Jesus to die for us. Then maybe thank him again. Do: Amend your list with today’s addition: 8) We have proof of God’s love. Wait a minute! What we’ve heard all week as we’ve been building our list from Romans 5 about all the good things that come with our salvation is how kind and loving and sacrificial our good God is. And he is all of those things. He loves us deeply and the sacrifice of Jesus in our place, for our sin, proves his love. He’s also the God who would send us to hell forever in his wrath if we were not in Christ. That’s a tough concept for a lot of people square with their understanding of a good God. Part of the problem is that we undervalue sin. We think of it as a cold when it’s really a plague. We think of it as dynamite when it’s really a nuclear bomb. A God of justice must not let sin pass. Let’s not miss how high these stakes are. We needed to be saved from eternal punishment in hell for our sin. And that’s what God gave us through Jesus. Think: Are you tempted to be ashamed or embarrassed by Christian teaching about hell? Why do you think we’d mostly rather not talk about the reality of God’s wrath against sin? Pray: Thank God for saving you from his own wrath through your faith in the blood of Jesus spilled for your sin. Do: Add the next item to your list: 9) We are saved from hell. Today, we wrap up our week-long list of all the benefits that come with trusting in Jesus for our salvation from sin and into a new, eternal life in God’s family. And this last one is huge. Have you ever heard the story of a father and his son, estranged and distant for years and years because of some disagreement, who come back together on the father’s deathbed and make peace with each other. They forgive each other and embrace (and probably cry). They have been reconciled. We were estranged from God because of our sin. We needed to be forgiven, and that’s what Jesus earned for us on the cross. It was over his empty deathbed that we were embraced by our Father in heaven. The relationship is fixed for all time. Jesus is alive again and we have been reconciled to God. We are saved, and we will be saved, this verse tells us. Once God has reconciled us to himself, we will not become unreconciled. We will be walking with him forever. Think: What did you have to do to convince God to “take you back” or reconcile you to himself? Why do you think he took action to make reconciliation with him possible before we even cared about it? 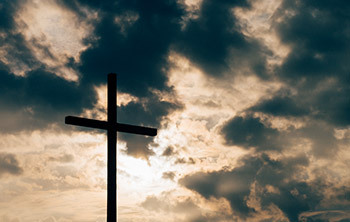 Pray: If you have trusted in Jesus for salvation, thank God for reconciling your relationship with him through Jesus’ death for us on the cross. Thank him that you are saved and will walk with him forever. Do: Finish your list from this week with one last item: 10) We are reconciled to God forever! Then put the list up somewhere where you will bump into it for a few weeks to be reminded of who you are right now, today, as a Christian.